Fana Mokoena alongside EFF members. Image: Fana Mokoena/Facebook. The BLF deputy accused several EFF members of apparently using ANC women as ‘scapegoats’ to hide their own issues. Economic Freedom Fighters (EFF) MP Fana Mokoena has questioned the motives of Black First Land First (BLF) deputy Zanele Lwana, who criticised the EFF for using African National Congress (ANC) women as “scapegoats” to hide their own issues. Sunday’s episode of The Big Debate sparked disputes on a number of issues, including the EFF’s red overalls and the party’s stance on foreigners in the country. 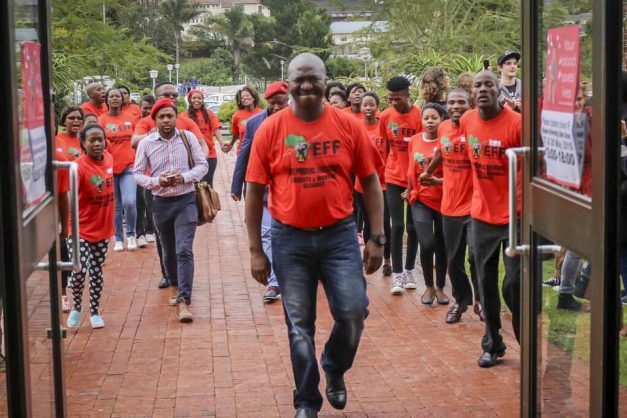 Lwana weighed in on the discussion and slammed the show for sidelining the BLF and accused the EFF of using ANC women as “scapegoats” to hide their own issues. Asked if he’d ever abused women, Mokoena replied no. The party defended their overalls on Sunday with Mokoena justifying that what people in the party chose to wear was a matter of preference and not a mockery of the poor, adding that the overalls were symbolic.